Riders boarded a late Green Line train on March 29. More than 400,000 trips have been taken on the T’s late-night subway and bus service since extended hours began in March, according to the MBTA — an encouraging sign as the transit agency continues a one-year test of whether after-hours service on Friday and Saturday nights should become permanent. 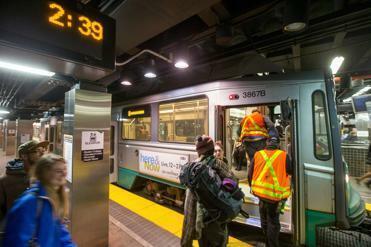 Governor Deval Patrick decided last year to implement the trial run after years of entreaties from riders and business owners clamoring for an affordable way to get home on weekend nights after outings and late-night work shifts. The agency extended the Friday and Saturday night closing times for subways, the 15 most-popular bus routes, and The Ride. Instead of closing at 12:30 a.m., service runs to about 3 a.m.
During the debut weekend in March, more than 18,000 trips were taken. Some wondered if popularity would wane as the novelty of late-night transit wore off. But Massachusetts Bay Transportation Authority spokeswoman Kelly Smith said Tuesday that ridership over the summer has remained relatively consistent, with 15,000 to 17,000 trips taken each weekend. This past weekend, ridership totaled at least 16,126 — though T staff have not yet calculated ridership for buses and for passengers boarding the Green Line above ground. Transit authorities have not decided whether ridership is adequate to keep the extended weekend hours past the one-year mark. Last month, when MBTA general manager Beverly A. Scott addressed the Massachusetts Department of Transportation board of directors, she said she was pleased with ridership, with the Red and Green lines especially popular. The current late-night ridership numbers have far eclipsed the T’s previous experiment with after-hours service. Between 2001 and 2005, the transit agency ran “Night Owl” buses that traced the routes of subway lines. During the first year, ridership averaged about 2,000 people per night. By the spring of 2005, when the service was canceled in a round of budget cuts, average nightly ridership was just 655 people. Martine Powers can be reached at martine.powers@globe.com. and on Twitter @martine-powers.